Above is his measured input characteristic with good 50Ω loads on each leg. Reading a hundred posts, it seems that he attributes this to legs of 0.167m length of RG11. The problem is that RG11 as most of us know it has a solid PE dielectric giving it a vf=0.66 and that 0.167m is 63° at 207MHz… so why the response above. A possible explanation is in the poster’s use of UHF connectors (mentioned indirectly) which might well each look like an electrical length of around 10° of 35Ω line at 207MHz. Plotting just one leg of the match being two such connector segments with the 62° length of RG11 in between and with a 50Ω load those on a Smith chart gives an input Z of 97.46+j1.92Ω, almost exactly the value of 100Ω desired for half the match. I do not know that this is the explanation of the poster’s observations, but it is a plausible explanation and a demonstration that for high accuracy measurements, the effect of UHF series connectors can be significant and needs to be considered. The poster comes to the conclusion it seems the short-cable VF measurement is more accurate than the long-cable measurement . Well, if you are ignoring the effects of connectors in the DUT, the opposite is actually true. Although vf is a function of frequency, it varies very little for practical coax cables above 10MHz… and the longer the cable is compared to the connectors being ignored, the more the cable dominates the result and the more accurate the result. Assuming that the two connectors introduce 7° of 35Ω at 144MHz (and that is a guess based on experience), we can redesign the match. 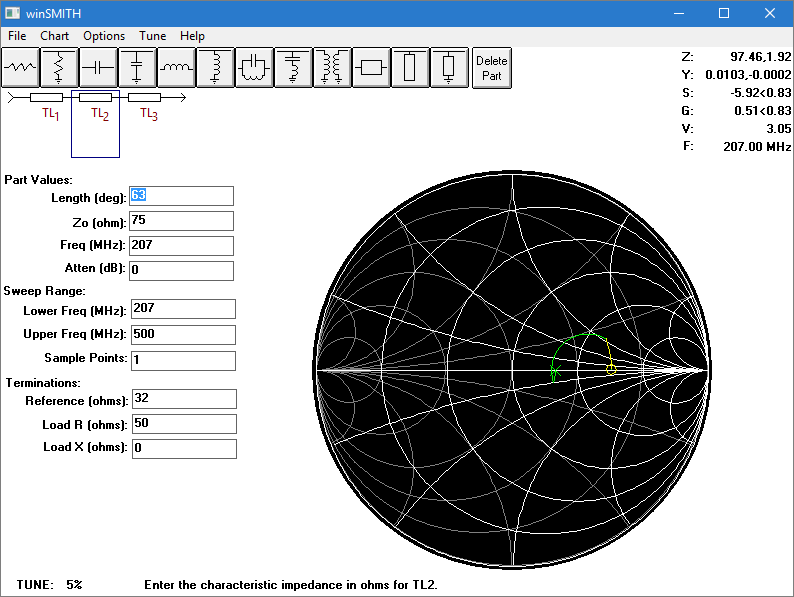 Above is a Smith chart of the solution which gives Zin=106Ω using 72° of 75Ω coax (well short of a quarter wave). Lets say we had measured accurately the vf of the coax to be 0.66, then the physical length would be 0.275m. The actual length required depends on the connectors actually used and their characteristics… UHF connectors are not standardised in those characteristics. This is a really simple match in theory and in practice, I have never had trouble setting them up. Implementors should measure accurately the vf of the coax used, especially foamed dielectric coax which is more inclined to variation. The electrical length and Zo of connectors and pigtails needs to be factored into the design. An antenna analyser is really useful, but more important is a basic understanding of theory and careful comprehensive treatment of the design and construction. The latter does not come in the box with the analyser.